It was perhaps no surprise that The Killers' album Day & Age beat Guns N' Roses' Chinese Democracy to Number 1 in the UK. But the failure of Guns N' Roses to hit top spot in the US, where the band's first album is a staple of classic rock stations from coast to coast, is more of a surprise. That's still a decent sale in tough times, but AC/DC's Black Ice, the first album from the band in seven years, shifted 784,000 copies in its opening week. As with Chinese Democracy's exclusive distribution via Best Buy, Black Ice went out only through Wal-Mart. There are already reports of grumblings around the GN'R camp about the Best Buy deal and its (lack of) promotion, though it's also been noted how Axl Rose has done no promotion whatsoever himself on his record. True, Axl Rose is threatening to sue Dr Pepper for 'misusing' the band name in their recent giveaway promotion, but that's hardly the same as making the late-night talk show rounds and giving interviews to the music press. "The label is really glad to have him back," says an insider at Geffen Records. "But it is frustrating because the album would have had a much better chance of going to Number 1 if he had only been prepared to show his face. You would have thought after spending 15 years on an album you might do a few weeks promotion." As noted, 15 years is an awful long time to make an audience wait for a new album. "People forgot about him" says Gary Cee, program director for the classic rock station WPDH in Poughkeepsie, New York. "He doesn't seem to exist anymore. AC/DC, Metallica - the audience has a sense that they're doing things, there's a connection there. With Guns N' Roses, there's no connection anymore." Cluttered, unfocused and bloated, Chinese Democracy makes The Spaghetti Incident sound like a classic. Trad Guns N' Roses fans don't want dated (as in, recorded in 1998) attempts at industrial nu-metal. They want Guns N' Roses, as in killer guitar riffs, slam-o hooks and unadulterated, hair-raising vocals. Axl, you forgot that bit over the years. The fans who adore Appetite For Destruction revel in the sound of a real live band, in Slash's gnarly riffs and solos, in the sweaty and sometimes sloppy band interplay that felt magical. More than that, they want to visualize the band making that beautiful racket - that is to say, Slash, Duff and Izzy (the drummer, we're not so sure which one music fans care about). Buckethead and Bumblefoot are fine players, but audiences haven't embraced what little they've seen of them. In fact, Buckethead seems to scare them. Tellingly, a straw poll in the MusicRadar office reveals that no-one can successfully name all nine musicians who are allegedly current GN'R members. Back in the day, Axl was notorious for making it on stage two, three hours late for concerts. People who've paid hard cash for a show don't like stunts like that, and they remember. The best bands know the deal: get on stage on time, play your hits, tell the audience you're happy they came. It works. Acting as though you're doing the crowd a favor by showing up...uh-uh. Guns N' Roses play Madagascar at the MTV awards 2002. It begins at 2:54. To much fanfare, Axl and his new GN'R lineup (since changed again) played this song at the MTV Awards back in 2002. 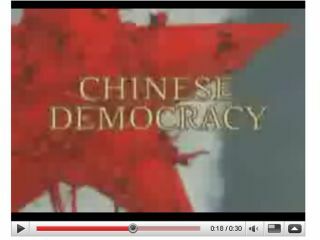 The response was overwhelmingly negative, yet of the 50 or so songs Axl had floating around, he still deemed it necessary to include this epic clunker on Chinese Democracy. Unfortunately for Axl, it has the kind of title one remembers. On mainstream and classic rock stations where older Guns N' Roses songs receive regular rotation, Chinese Democracy's title track has flatlined. "I'm not talking about a bad reaction," says Gary Cee. "I'm talking no reaction! I only give it a few spins a week now. Meanwhile, people call and ask for November Rain, Civil War, Paradise City - the old stuff. This new record? Not one phone call." The Chinese Democracy single peaked at only #34 on Billboard's Hot 100 chart. Axl, you never had a truly great hairstyle, but c'mon, don't go out of your way to look weird. Age gracefully. Hire a stylist. Not the best idea. When MusicRadar dropped in during the first on-sale date, there seemed to be little to no interest in the album. And aside from one poster and a small display, there was no sense that an 'event' was taking place. The wrong retail outlet? Perhaps. The Eagles and AC/DC apparently did their research, which showed that their fans shopped at Wal-Mart stores. Where did it come up in market analysis that Best Buy shoppers were Guns N' Roses fans? Bottom line: after 15 years, Chinese Democracy shouldn't be an album music fans should have to go out of their way to find. It should be everywhere. It should be available at Dunkin' Donuts. It should be on sale at the local hardware store. Not every town has a Best Buy, but every town has a McDonalds. A copy of Chinese Democracy with a Happy Meal? Hey, it couldn't hurt.